This dresser was in my bedroom growing up and it was in desperate need of a makeover! As I was redesigning my master bedroom, I knew exactly what I wanted to do! Leave a comment and tell us what you think! I’m gonna be following your blog for sure! 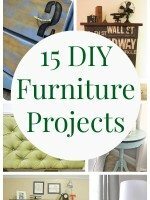 I love your two projects! I can’t believe how you breathed new life into your dresser! Absolutely gorgeous! This is a great transformation!! You are starting out with a bang on this blog! Very impressive! So naturally I decided to see what else you’ve done; imagine my surprise when I saw you’ve only got 3 posts! Your blog looks like you’ve been at this forever! I’m your newest follower, and I can’t wait to totally stalk you. Love your dresser make over. Ya’ll did a great job. Sow pictures of how you accomplished that beautiful piece. Did you spray it and paint the top black? Put me on your email list. Love it. Great redo! I’m working on something similar. Fun and congrats on your first post. I just found your blog and you did a great job on the dresser. I am trying to find one that I can paint so you gave me inspiration, thanks. I am your newest follower. This turned out fantastic. What did you do to the top? Yum! What a classy redo. You have totally kicked that dresser up into designer style territory. And the black and white theme looks gorgeous. That looks AWESOME! Love the black and white! Looks fantastic! I love everything about it! It looks beautiful and you’ve inspired me to GO FORTH and paint my secretary.. This is right up my alley! I love the oil rubbed bronze paint. 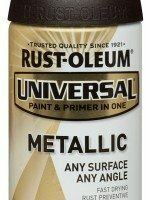 I have painted most all of my door hardware with it. I love the 2-tone dresser redo. Great job! This looks great! I love the two toned look! Gawd I love the top dark–that makes it. Really great job. We’d love to help and give you some suggestions if you’d like! You are so sweet!! Thank you for your kind comments! Contact us at classyclutter4@gmail.com if you’d like any help! We’d love to help you create something beautiful! Omigosh! This is the best ‘before’/’after’ creation ever! Love the style and colors chosen. 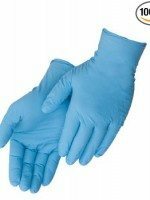 Do you make house calls? How about if we send you pictures of our (shudder) dresser, could you just give some suggestions? You have just been added to my Favorites. Great blog site!! Love it! Love the frame layout on the wall, too! I have an old rocking chair I’d love to paint. I’m worried I’ll ruin it. 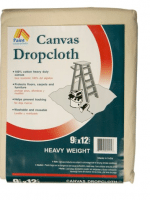 Before you painted did you sand it down a little? I LOVE this dresser! I love the contrast yet it’s so beautiful! very dramatic with the black – looks great! holy crap, it turned out awesome. i want it!! Didn’t think that ugly dresser could look so fabulous! Great job!! I just happened upon your blog and saw this post. I have that same bedroom set and have been thinking how much I’d love to do something to it. I absolutely love this and will copying it immediately! Much better than spending a few hundred dollars on a new one! I can’t wait. You did a fab job~it looks gorgeous! it looks fabulous! it was outdated before, but now it is very cool and chic! Spectacular makeover!!! I just love how you updated this piece! Beautiful makeover and I love the hardware! I just found you through the Sunday Showcase Party and became a follower! This is beautfiul! I love the antiquing, just the right amount. Do you use sandpaper, or a salt rub? this is amazing. i’m dieing to find a new dresser and make it fabulous! Truly inspiring! What a beautiful dresser! You’ve just inspired me on a piece of furniture my mom offered to pass on to me! Thanks! Just found your site. I have always wanted to learn how to do the distressed look. Can you give a step by step instruction on how you did the dresser (from your home) above? Thanks. This is GORGEOUS!!! I love it!!!! what a difference!!! It’s absolutely gorgeous! That is just gorgeous! Love the black with the white! I would love for you to come by my party and link it up – the party just opened! So pretty! I love the color. I’m pinning this! I’m a new follower from Miss Mustard Seed. Gorgeous! I did one similar to this and it is my favorite piece in our home. Great job! You ladies have inspiered me to take in charachtered ( I don’t believ that’s a word) furniture and be creative. The only problem is making my husband belive they will look elegant at the end!! It looks like a completely different dresser. I love, love, love it. Great job!!! Can you tell me exactly HOW you did it? Do you have any closer pics to see if it’s smooth? We never can get our spray paint to go on smooth. Any tips? Hi- i know I’m late to the game (by like years) but I love this! 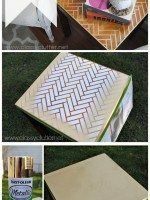 (came her via pinterest and your spraypaint review). 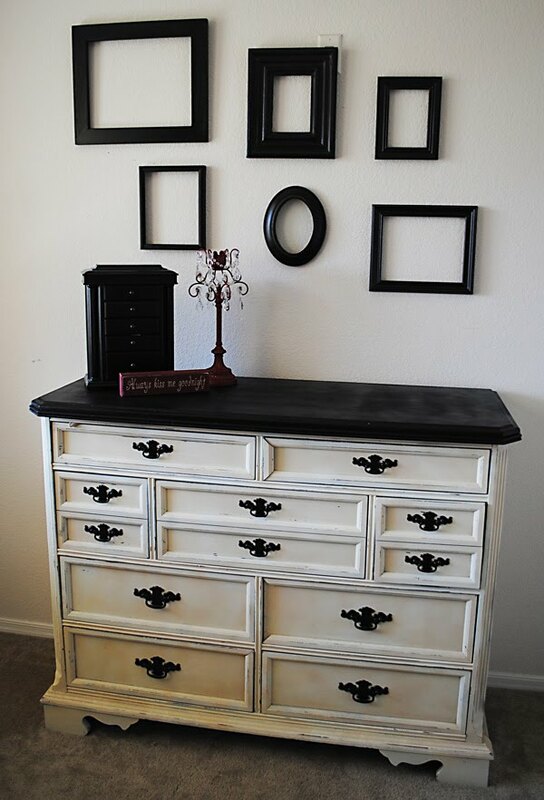 This dresser is awesome, how did you get the rustic/warn down look around the edges? I’d love to do something similar. thanks!! STUNNING! I love that you made the top surface a different colour from the rest of the piece for contrast. What a transformation! Love the dresser. I was just looking for ideas for an old piece that I have. What type of paint did you use on the top? What did you do the top with? I used Krylon Ivory spray paint! Thanks!!! 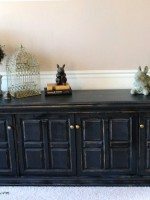 I have my mother in law’s old buffet that looks similar to this dresser and I would love to redo it this very way!! !Can you give a little more specific detail on how you did the dresser? Was it all sprayed and how did it not spray all over? (I guess I am a messy spray painter…)! what was the brand of the dresser which you renovated? What did you use for the top? 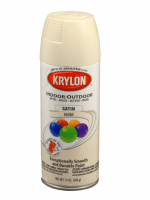 Is Krylon the brand for the oil rubbed bronze as well? I just have a few questions. Did you strip the finish off the wood prior to painting the dresser? Also did you use spray paint or a brush? Thanks so much!!! Did you sand the dresser before painting and how did you distress it? I am a newbie when it comes to chalk painting and can not get enough. My first project was to paint my sons bedroom suite and everyone was completely shocked when I finished it. I will have to say that I shocked myself. 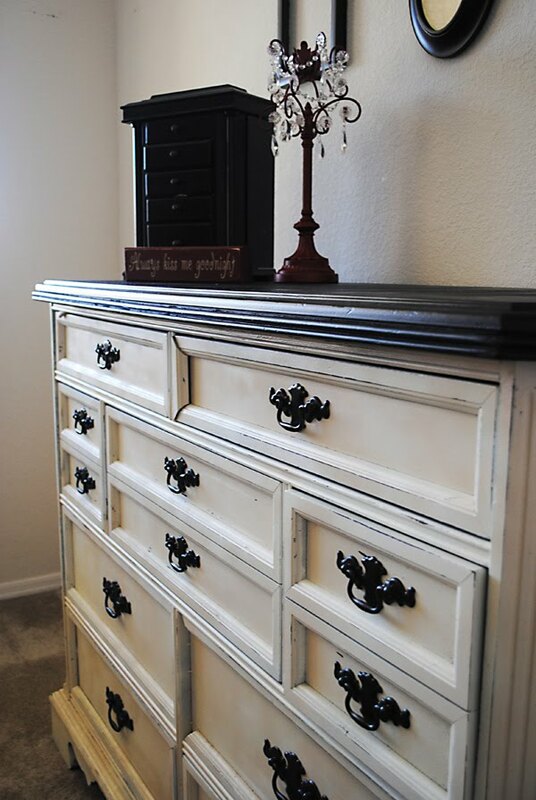 I used Annie Sloan paint in coco and old white for the base colors and I used General Finish black gel stain and the high gloss for the dresser top and night stand. Of course I used the Anne Sloan clear wax and I used the dark wax as well to bring out all the details. I changed out the knobs and I couldn’t be more pleased. I am totally addicted now so my next project will be a very nice bathroom sink that is in my workshop. It looks nice now, I just have some ideas floating around in my mind that will really make it pop. I think that chalk painting has created a monster. Needless to say there is nothing safe in this house now. I have my eyes on some other pieces in my home. I am a happy chalk painting women now!